The online registration for the ANWG conference in Bellingham begins Tuesday January 8th. http://www.anwg-conference-2013.com/ or go to northwestweavers.org and poke around. Thank you to the committee that recommended my application to ANWG, I was awarded one of the Grants for the Conference in June. 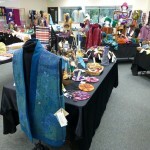 So thank you Association of Northwest Weavers’ Guilds judges too! As a first time Conference attendee, this is a HUGE help. It will be great to have this focused time with other weavers. I am looking forward to getting too many ideas and getting worn out. I recognize a lot of names in the Instructors section, mostly through my involvement on Weavolution, and I am interested in too many of the seminars being offered, of course. But after reading through all the classes many times, I printed out the schedule and class calendar and circled my first choice schedule, and second choice too, just in case. Now I just have to wait six months! Thank you again, all my Guild members, you who helped me get up the learning curve in the weaving world and encouraged me to apply for the Grant. You are an amazing group of creative people, and I am truly thankful that I found you all. The library has received 20 books as a gift from Gail Larson. To create a list of these new acquisitions, we are trying an experiment with a Web site called LibraryThing. Go tohttp://www.librarything.com/catalog/OWGLibrary and take a look. A printed list will be generated from the site to be available at the fire hall. We hope to have these books processed and ready for checkout at the January meeting. Fay and Kathy look forward to getting your comments about the possibility of redoing the OWG library catalog using LibraryThing.